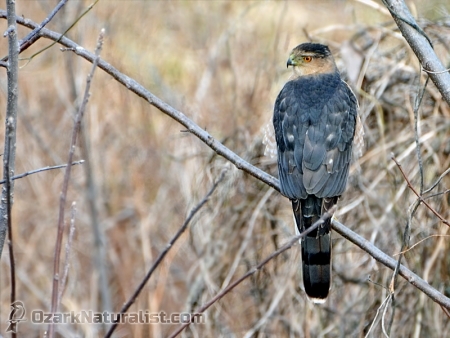 A Cooper’s Hawk can be difficult to distinguish from a Sharp-shinned, but this one was large enough to remove any doubt. This was a Cooper’s and likely a female since they are larger than males. Still running 70 mph, I could not stop in time to pull over. That meant turning around, driving a mile back and making another pass. Ready this time, I stopped at a distance, shooting the photo above before moving closer. Unfamiliar with their behavior since this was the first Cooper’s I had ever “worked,” I didn’t have any idea what to expect. Do they sit and let you approach or are they like Red-tails, so skittish that it seems they bail if you so much as think of pulling over. The road was busy, with one 18-wheeler after another thundering past. I waited for a break in traffic so I felt safe, then crept down the shoulder. Close enough to shoot through the passenger window, I killed the engine and stopped. I had the camera halfway up and the hawk seemed like she was staying put. But as I found her in the viewfinder and the autofocus engaged, she took off, flying down the fence line and landing behind me. She didn’t go far, maybe 100 yards, but I wasn’t backing up on the shoulder for even that distance. That was a conversation I did not want to have with a trooper and it’s a good way to get yourself dead. Considering another pass, I decided to try on foot because I did not want to deal with the traffic again. Walking towards her, I would take a few photos, move 5 or 6 steps closer, shoot a few frames, and repeat. She let me get much closer than I expected, enough for frame-filling shots. She was sitting still, which I appreciated, but other than changing the position of her head, she’s in the same pose in every shot. Getting alongside or past her so that I could get a profile or frontal shot would have been ideal. 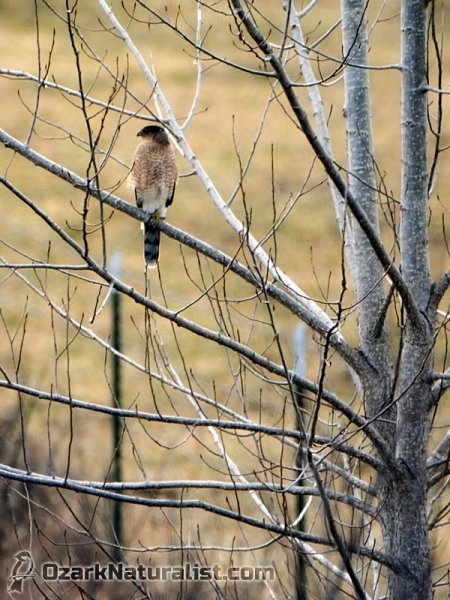 However, she wasn’t that tolerant, flying into the field, then swinging back to the fence line a couple hundred yards in the other direction. Back to the truck. I idled towards her new perch, one wheel in the grass to put as much distance between myself and the onrushing traffic as possible. But, done with my shenanigans, she disappeared into the trees along the creek. I blew her a kiss and thanked her for her patience. 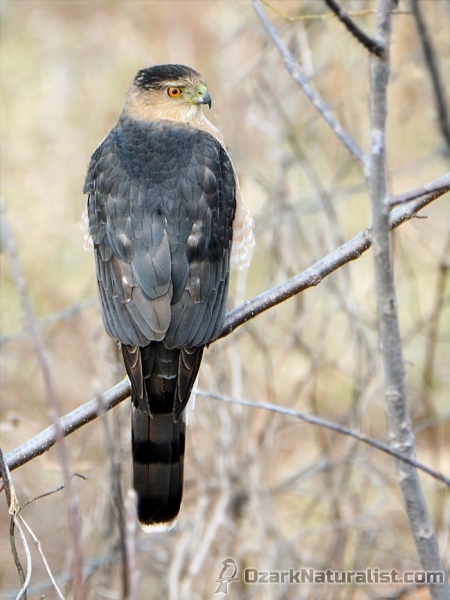 Cooper’s Hawks do not occur here in large numbers though they are year-round residents. And to this point, the only photos I had were two blurry frames that I shot in the El Dorado Springs Dollar General parking lot. 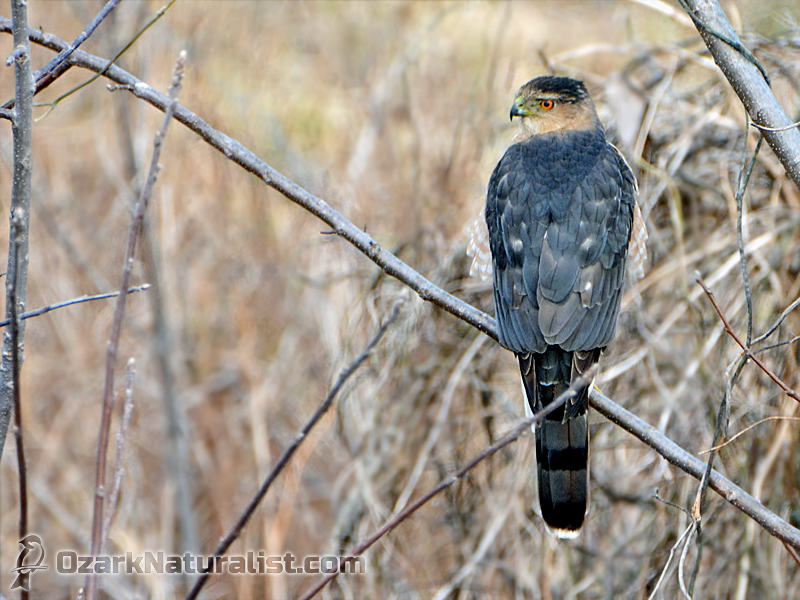 So, Cooper’s Hawk was another nemesis bird, the second I had removed from my list that day and the third in two weeks. If they keep dropping at this rate, I won’t have any to pursue and that makes me sad. Of course, I am not going to keep checking them off at this pace, so I should have nemesis birds to chase for a while. Let’s see: Golden Eagle (my absolute Grail Bird,) Harris’s Sparrow, Snowy and Short-eared Owls, and a host of migratory warblers among others. Yeah, I’m good for now.